In my last entry, I mentioned that my cycling form is pretty good. The reason for that is that I’ve been training for the Gran Fondo Cymru, on 28 May. This one day bike ride is modelled after the European Gran Fondi (in Italian) or Cyclosportives (in French). The most famous of these being L’Etape du Tour where amateurs get a chance to ride the route of one of the stages of the Tour de France. This type of ride isn’t really a race (although you do get an electronic timing chip), they are more of a sporting challenge. The Gran Fondo Cymru is being held in hilly North Wales, in the Snowdonia National Park. 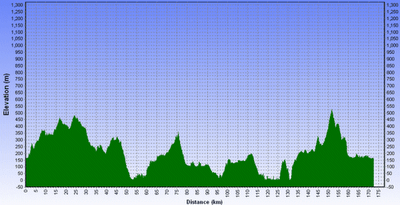 The route profile above shows you that there’s some tough climbs (3575m of climbing) along the 173km/108 mile route. I’ve been training with Damon and Gerard who are also doing the ride with me. The longest ride so far…165km/100 miles in the Cotswold hills, north of Oxford. I also went out with the Oxford Triathlon club last Sunday with a colleague at work who is an Ironman triathlete. Anyhow, the Cotswolds while a bit bumpy are not a patch on Snowdonia (named after the highest peak in Wales, Mt Snowdon)…so wish us luck, I think it’s gonna be hard! 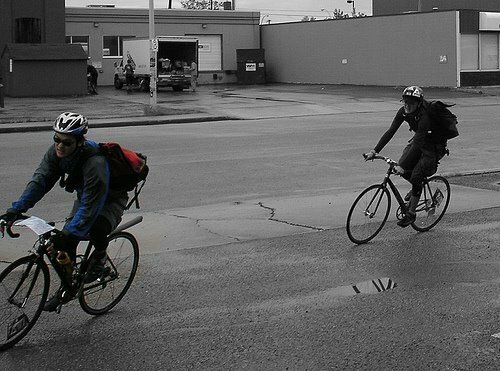 Above – Me in the Main Race final of the 2004 Cycle Messenger World Championships…I finished 23rd.